See a list of special events that will take place throughout the meeting. Within two business days of registering for the 2019 Pacific Division meeting, you will receive an email invitation with instructions on how to access the meeting guide. The invitation will be sent to the email address that you entered when you registered for the meeting. If you already have a Guidebook account, your invitation will instruct you to sign into the APA Philosophy Meetings app using your existing login details. When you open the app, you will be prompted to enter the email address you were invited with and your Guidebook password. If you forget your password, you can reset it using this link. If you do not have an existing Guidebook account, your invitation will include a temporary password. When you open the app, you will be prompted to enter the email address you were invited with and your temporary password. You may change your password in the app settings at any time. 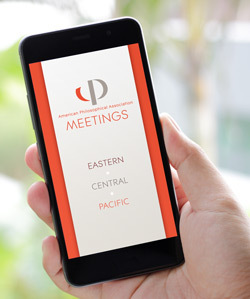 Once you have successfully entered your email address and password, the 2019 Pacific Division Meeting Guide will open on your device. Session locations will be added to the app on the first day of the meeting. If you have questions about the meeting app, contact us.